The Minister of State for Power, Works and Housing, Alhaji Mustapha Shehuri says the Federal Government will not tolerate excuses for delaying the completion of ongoing road projects. The minister gave the warning on Friday in Yola when he inspected some ongoing federal projects. He expressed dismay over the slow pace of Cham-Numan road rehabilitation project, being executed by CGC Nigeria Ltd. He said that Nigerians were eager to see the project delivered on schedule because of its strategic importance, adding that they were not ready to take excuses. “I want to be very candid with you, I am not happy with the pace of work on this project because this is a contract that was signed a year ago, with a completion period of 24 months. “In 12 months, you have not completed any section of the 46km project; this is not what we expected from you because the ministry has been patronising your company. “You have projects all over the country and I believe you are aware of the Federal Government’s eagerness to deliver to Nigerians, especially in the area of the road sector. “ So, you better double up what you are doing; we are not here to listen to excuses, we are here to deliver on what we have promised as leaders,” he said. 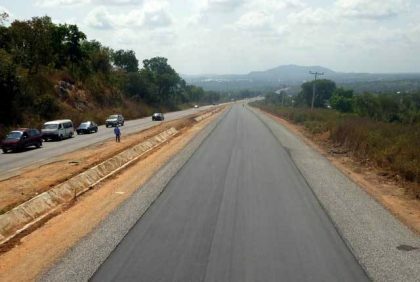 Mr Salihu Abubakar, the Federal Controller of Works in Adamawa, said that the 46km Cham-Numan road project was awarded in 2017, with a completion period of 24 months. He said that earthworks, scarification, sub-base, stone base, binder course, wearing course, surface dressing, culverts and bridges were all included in the project. He, however, noted that the earthwork, sub-base and stone base aspects of the project had been completed up to 4.5km, while the concrete line drain had been completed up to 412 meters. Abubakar said that two box culverts had also been constructed, bringing the project to six-per-cent completion level after a 48-percent time lapse. Mr Wang Baisang, the Project Manager of CGC Nigeria Ltd., commended the Federal Government for awarding the contract to the company. He said that the project was awarded to the company in May 2017 but it could not commence work until October because of the rainy season. “We have some difficulties in the course of executing preliminary works in the project but we have overcome the problems and we are fully set to complete the project,’’ he said.